Our office is open 8:00 am to 5:00 pm Monday through Friday. Patients are seen by appointment only. Please call to schedule an appointment during regular business hours. 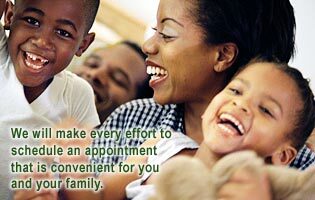 Every effort will be made to schedule an appointment that is convenient for you and your family. If you are unable to keep your appointment, please call to cancel or reschedule. The doctor will review the patient’s history, examine the patient and order any necessary testing. These tests may include x-rays, hearing testing, cat scans or other special tests the physician may need for treatment purposes. The physician will discuss diagnosis and treatment options with you and/or your family. A follow-up appointment will be made if necessary. If surgery is indicated, your physician will discuss this with you and/or your family. The nurse will call you to schedule your surgery, give you pre-operative and post-operative instructions and schedule a post-operative visit with your physician. Please bring a list of current medications each time you have an appointment. Please obtain a copy of your medical record from your primary care physician or child’s pediatrician. This will aid your physician in your treatment and pre-authorization of any testing or surgery that may need to be performed. During regular business hours, your call will be answered by our receptionist and routed to the correct department. Please inform the receptionist if your call is an emergency. Phone calls to nurses will be routed to the nurses’ voice mail. Please leave your name, the patient’s name, patient’s date of birth and a phone number where you may be reached. If you are calling for a prescription refill, please leave the name and phone number of your pharmacy. Prescription refills are only phoned to the pharmacy during regular business hours. Please be patient when waiting for the nurse to return your call. All calls are returned the same day and in the order they are received. Calls after 5:00 pm and on the weekends will be answered by the answering service. There will be a physician on call if you or your family needs urgent medical attention. Pain medicine refills will not be called in after hours. We will file your insurance for you. To ensure the insurance information in your chart is correct, we ask that you update your information sheet once a year or at any time your information changes. If your insurance changes, please bring your new card with you so we may make a copy. If your insurance company requires a referral for you to be seen by a specialist, please contact your primary care physician to obtain a referral before your appointment. Make sure your referral is current each time you schedule an appointment. In cases where the insurance company disputes the claim, patients are expected to pay their bills in a timely manner. We ask that you pay your deductible and/or co-pay when you check in at each visit. We accept cash, checks, MasterCard, Visa, Discover and American Express. Mid-South Ear, Nose and Throat, P.C. d.b.a. Mid-South Sinus Center, P.C.